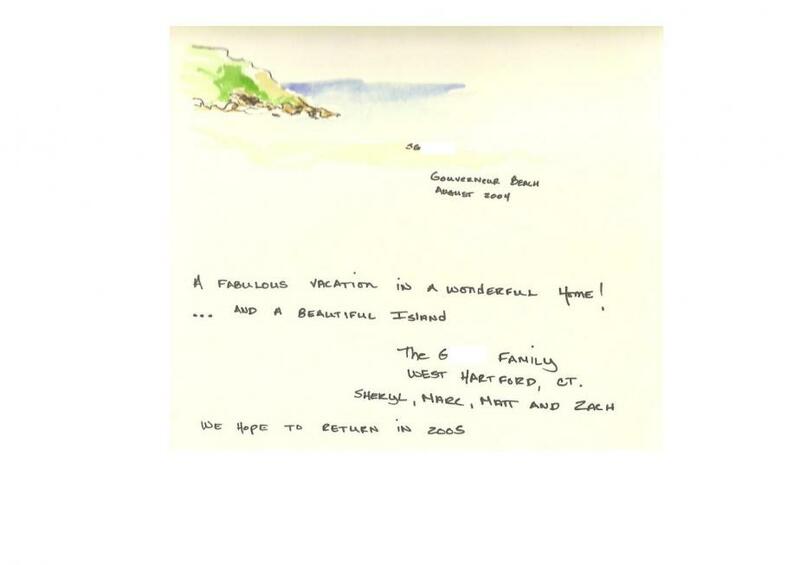 Over sixty guests have contributed to the Villa's Guest Book to date. We will be gradually publishing their reviews on this page. In the meantime, here is a short extract. Enjoy! "We absolutely love La Maison ! Everything about the villa is perfect...the furnishings, the outdoor living, the fresh foliage and of course the spectacular view ! This is our favorite spot! We have been coming to St Barts for 16 years. This year we had our children join us for the 2nd week and were excited to introduce St Barts to our eldest son's fiance C. She loves it so much that she hopes to rent this villa next year ! As well F. was delightful. Merci! Merci!" 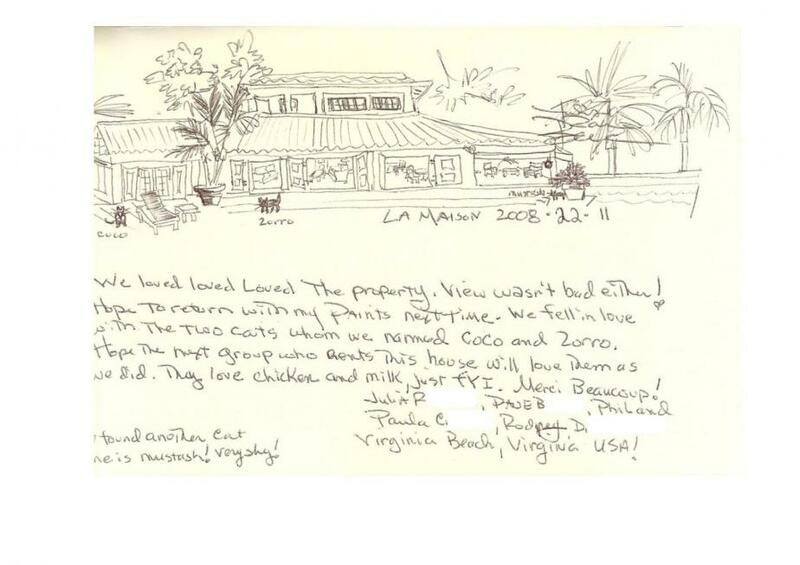 "Dear Jean-Loup, our three sons treated us to a 40th anniversary holiday in your lovely villa, La Maison. M. B. and D. and their wives and our first grand-child, V. enjoyed making special family memories: an unforgettable stay in St Barth and your comfortable home. Thank you for the grand opportunity to experience a bit of heaven... "La Maison" est magnifique!" "We loved loved loved the property. View wasn't bad either ! Hope to return with my paints next time. We fell in love with the two cats whom we named Coco and Zorro. Hope the next group who rents this house will love them as we did. They love chicken and milk, just FYI. Merci beaucoup!" "Semaine de reve en famille. Plage, piscine, et langoustes au menu. "La Maison" est chaleureuse et conviviale, et quelle vue !!! Nous reviendrons tres tres prochainement. Mille Mercis". "For the third time we have spent two wonderful weeks in this beautiful house. L and T. for the first time. Beaches, fabulous food, deep sea fishing, wind surfing. Even seeing a turtle from Eden Rock. Thanks to lovely F. for enhancing our stay here." After a wonderful boat trip, we thought it couldn't be better. Then we arrived at your house - and it could ! It's so tasteful, wonderful - simply - magnifique et pittoresque ! Thanks a lot for such wonderful days and moments. We really loved it and it was quite hard for us to leave your house ! Merci beaucoup. Danke schon." "We enjoyed your villa so much. It was equipped with everything we needed, and we loved the view of St Jean... so beautiful. Thank you for sharing it." "C'est la seconde fois que nous revenons a La Maison. Nous passons toujours des moments merveilleux. Une maison de reve, un endroit de paradis. Merci a F. pour sa presence et son sourire. A l'annee prochaine". "Dear Jean-Loup, our second visit to your villa was even more special than our first. F. is such a dear and took care of our every need. La Maison is the "best"."